Reading those words now, some forty-six years after he spoke them in front of the gathered fans and pros of the day, I wonder what he would have said had Murray Leinster (working name of William Fitzgerald Jenkins) been the Dean of something other than science fiction. After all, he wrote mysteries, and westerns, and romances (under the name Louisa Carter Lee), and had there been the same kind of fandom surrounding those genres, what might he have told them as Guest of Honor? For Heinlein, though, writing anything other than sf was very much an aberration, and, in fact, it wasn't until after his death that those few stories were reprinted under his name. 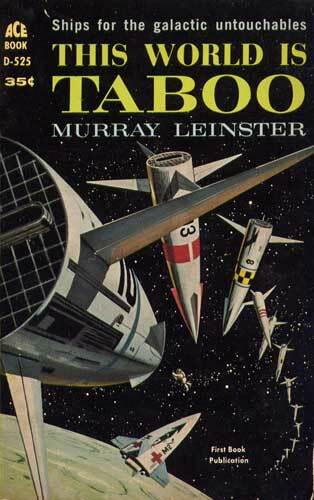 Leinster was a total pro; he edited his own anthology (Great Stories of Science Fiction, Random House 1951), unlike RAH who relied on Fred Pohl and Judith Merrill to pick the stories for Tomorrow, the Stars (Doubleday 1952) [iii]. If there was a market he could figure out a yarn for, he wrote it and sold it. This strikes me as a handy thing for a professional writer to be able to do. My eyes were on Leinster, though. Like most of those attending this never-to-be-repeated convention, I'd been reading his books and stories pretty much since I'd been reading sf. His stories had been frequently reprinted in those days, Groff Conklin alone having presented me with nineteen of them in various anthologies, and he was no stranger to the other anthologists, major and minor: Wollheim, Derleth, Bleiler & Dikty, Merrill...he was a favorite of the editors, and therefore (and/or concurrently/consequently) a favorite of the readers. How did this tiny little convention get the Dean? That's easy: he lived just down the road a piece in Gloucester. It's difficult even now for me to imagine one of the Giants living in my almost-backyard, but there he was, and remained, until his death in 1975. I was barely even a faan back then. I had attended a number of comic conventions, but DFC was my first sf con, even if the guy running it was a comic artist rather than a writer, faan or pro. The idea of meeting and speaking with one of my heroes, therefore, was more than a little alien to me. Will, on the other hand, was an old pro at this. He knew how not to embarrass or discourage a fanboy, a skill I was later to discover was common in most pros, but appallingly lacking in others. Above all else, Will Jenkins was a gentleman, jokes about brunettes being pursued with "vigah" notwithstanding. Robert E. Lee is responsible for my being a writer....[O]ne morning I was in school...[and] they made a very tragic discovery. They found that it was Robert E. Lee's birthday and nobody had remembered it. So the Principal, of course, went into a panic and immediately sent messages to all the teachers that they were to read something to us pupils about Robert E. Lee and let us write a composition about him...I wrote a composition, I always loved long words, and I put some nice long words in it....[A] couple of weeks later the Virginian Pilot [the Norfolk, Virginia daily] printed my composition....it made quite a stir and a Confederate veteran sent me a $5 bill. ...I took it down to the [Cape Henry] lighthouse....I jumped off the top of the lighthouse hill and glided down through the air and damn near broke my neck....I took a snapshot of myself and the glider and I sent it, with an account of my achievement, to a magazine called Fly it was the first aviation magazine in the United Statesand they sent me a $5 bill. That was $10 I'd made out of writing. I started about thirteenevery night I'd come home from the office and write 1,000 words and I did that everyday for a year, 360,000 [sic] words, and I tore it all up because it was lousy. Eventually he began selling epigrams and filler material to The Smart Set, one of the most important magazines of the day, a dozen short pieces for another one of those Lincolns. So, he finally was a pro writer. How much of one? "The first year I was writing, and selling my stuff, I made the magnificent sum of $72." One day I was in...the office of this magazine, and I boasted to them that something that they had returned I had sold somewhere else. George Jean Nathanit wasn't fair of him but I was 17 and I was flattered as hellhe asked me to save my name, Will Jenkins, for Smart Set and use a pen name for "inferior" magazines. 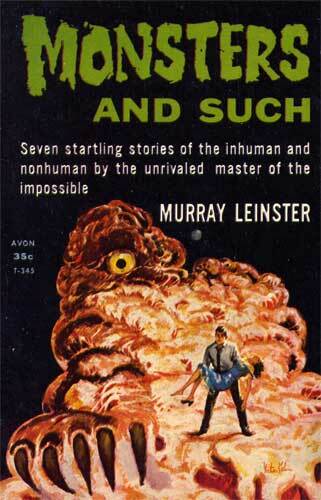 Thus was born Murray Leinster, a pseudonym concocted from family names. It wasn't too very long before he discovered that those "inferior" magazines paid Leinster far better than the more aristocratic Smart Set paid Jenkins, though, so he devoted his energies to pulpdom and let the slicks slide. 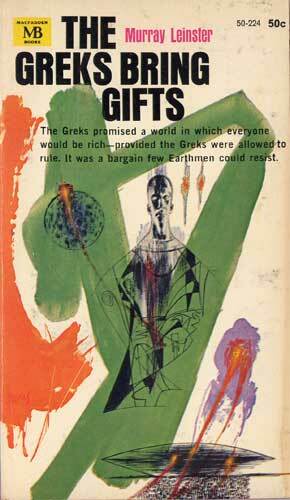 Jenkins began writing in the 'teens of the 20th Century, and was still writing and getting awards in his sixties. In 1962, two years and a bit after the appearance of his Ace novel The Pirates of Zan (originally serialized in Astounding as The Pirates of Ersatz , which title I like much better), he was (in the words of Sam Moskowitz) "...voted one of the six favorite modern writers of science fiction..." [emphasis SaM's]. 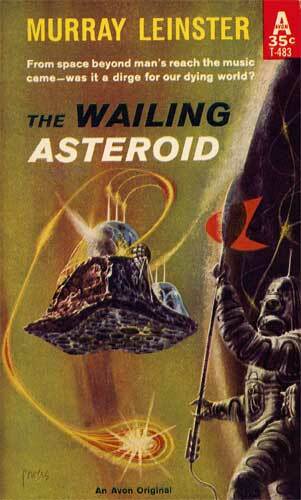 His last story appeared in a 1967 issue of Argosy , and a year later his last article appeared in The Writer . Jenkins was a lot like the great jazz saxophonist, Coleman Hawkins. I know that's an odd comparison, but stick around and you'll get it. The Hawk was a skilled musician who relied on his chops to make music instead of just memorizing licks. This, in large part, was a major reason why he was as successful during the post-war Bop period as he was during the Swing/Big Band era; that, and his clear understanding of what the Boppers were doing. He liked the renewed energy Bop brought to a moribund jazz world, and he was able to adapt his playing style to the growing sophistication of both the listeners and the other musicians. He may never have attained bull-goose Bophood, but he adapted quite easily and well to fronting small combos. Given all that, it would be easy to take the parallel with Hawkins further by cleverly linking story with song, book with album and so on, but you're faced with that kind of lit-crit booshwah enough here on the Information Turnpike without my adding to it. The simple fact is that Jenkins and the Hawk blew damned great stuff, and a great solo or a great story are all you need to prove yourself to anyone who matters. Eventually, about the time he was 21, his boss (Jenkins was, by this time, a junior bookkeeper at Prudential) became aware of his extracurricular activities and advised him that Prudential didn't like its employees to moonlight, so he'd have to stop. After admitting that he was, in fact, writing, Jenkins stood mute. He was then taken up on the mountain and shown the kingdoms of the Earth if he would only bow down. Well, okay, his manager offered him a couple extra bucks a week to spy on his fellow workers and report any who complained about the company. Fat chance: "I resigned on the spot and it was worth all the trouble...when that guy pulled that on me." He'd wanted to be a chemist; instead, he became an inventor, maybe the next best thing. One of his inventions is still used today: a process of front-projecting images onto a background and actors instead of rear-projection (which prevents the camera from moving). Perhaps the most famous use of this technique was during the "Dawn of Man" part of the Kubrick/Clarke film, 2001: A Space Odyssey . Most of his inventions, though, were firmly embedded in the pages of his stories. The annual award for best alternative history work, The Sidewise, is named for his story in the June 1934 Astounding , "Sidewise in Time," which was later combined with five other stories and issued by Shasta in 1950 under the same title. 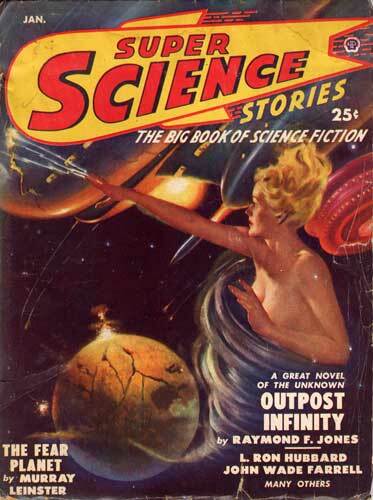 The 1934 story isn't the first time stfnal writers had played with the idea of alternate worlds and timelines Wonder Stories ran John Taine's "The Time Stream" in the December 1931 issue, and there was an ad hoc anthology of speculative essays edited by one Sir John Collings Squire in 1931 titled If It Had Happened Otherwise that included a piece on the American Civil War by no less a personage than Sir Winston Churchillbut let's face it, Jenkins/Leinster did it better than they did, and made it look easy . That for you, Sir Winston. That wasn't his only literary invention, though. In "A Logic Named Joe" in the March '46 issue of Astounding , he basically rolled up his sleeves and invented the whole damned computer InterWeb thing without breaking a sweat. That for you , Al Gore. It's difficult, at some forty-plus years' remove, to recall with any surety just where I first read a long-time favorite author. In my case, in fact, it's even more difficult, because most of my reading when I was in my pre-adolescence was in anthologies, which I saw not necessarily as collections of individual stories by individual writers, but as massive sources of days and days worth of anonymous reading, like television I could make up in my own head, if you will. I wasn't concerned at first with who wrote the words; I was too busy making pictures in my mind. That changed at least a little when I checked Groff Conklin's Science Fiction Adventures in Mutation (Vanguard 1955) out of the library and read a disturbing little story titled "Skag With the Queer Head" by someone whose name I didn't learn to pronounce correctly until just before meeting him: our subject, Murray Leinster. I was initially drawn to the author's name because one of my aunts married into the Murray family, and for a nine year-old kid, it doesn't take much more than that to make a connection. When Deena had her puppies, she was attended by no less eminent a person than Dr. B. J. Danil, late Wharton Professor of Experimental Biology at BraddockUniversity. For Deena was no ordinary dog. Neither she nor her mate, Skag. They were the only two dogs of their kind, in fact, in the whole world. I'd read my share of "mad scientist" yarns, of course, as well as seen them on TV and in cartoons (remember the Superman cartoon with the giant flying robots? Now, that was a mad scientist! ), but never before one in which he wasn't just a foil against which the Hero acted. Or perhaps he was, if you accept that in this case the Hero is a genetically altered Malamute named Skag. For once, in all the stories I'd read up until then, science wasn't the salvation of anything, but rather the weapon wielded by an uncaring and unfeeling human against someone who should have been his Best Friend. Skag and Deena are the results of experiments in giving animals intelligence on an almost human level, in this instance by forcing their heads to retain the same shape as a puppy's, even as it grows larger, thus increasing brain size and intellect. Nothing unusual about the idea of smart dogs; Simak used it in his City sequence, and Heinlein used it more than once. The difference here is that Skag and Deena know what's been done to them, understand the lack of compassion and humaneness in their tormentor, and are determined that the same things will not be done to their pups. They act heroically, if impassively, with little of the rage and contempt the doctor shows them, and in the end are left to themselves to raise their pups as simply dogs. Leinster could have let it go at that, and still have created a pretty intense yarn, but that's all it would have beena yarn. He was never content to take the easy out, though, and if Prof. Danil is a prick, the old geezer who brings his mail through the Alaskan Winter, Joe Timmins, isn't. He's human to the core, which means that he has nothing but respect and affection for Skag and Deena, and they reciprocate. There are scenes throughout the story, short as it is, which point up Danil's intentions towards the pups, as well as his two original subjects, and it becomes very clear early on that they know exactly what's going on. At one point, as he tries to take one of the pups from Deena, she grabs his wrist in her teeth; as he pulls out a gun to kill her, Skag immobilizes his other arm. Then, in a key incident, the two dogs then argue in their own "language" over what to do next. Deena, protective of her offspring, wants to simply tear him up. Skag, knowing full well what would happen if she did, twists Damil's arm until he drops the gun. Skag then carries it off to the side, then stares at Danil until he slinks away. I won't describe the final encounter except to say that what follows is inevitable, and disturbingly satisfying to a kid who could never stand cruelty to animals. It stuck in my mind for years after, and upon re-reading it for the first time in decades, I find it still as disturbing, if not as groundbreaking. You can say that about much of Leinster's work, really. 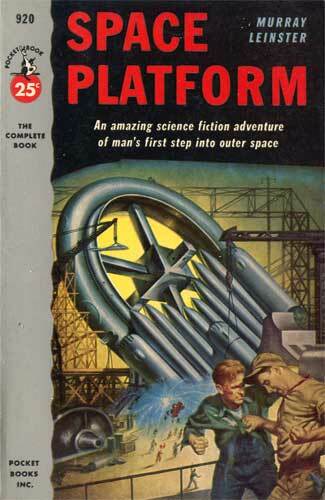 He wasn't so much a Cordwainer Smith as much as he was a Doc Smith. I hasten to add that I do not see this as pejorative in the leastnot everyone sits comfortably on the cutting edge, but it don't mean they can't still be plenty sharp. Leinster never fails to entertain, never makes a wrong move, never ceases to amaze. His body of work isn't just long and broad, it's got depth. It isn't self-consciously literary, and he eschewed pretentiousness, I think, not from any deliberate decision but just because it didn't occur to him that it might serve the stories he wanted to tell. I love my Cordwainerist stories, believe me I do, but I love my Docologist stuff just as much. I know gourmet writing when I taste it; whether the robust Provençal of Bester's "Fondly Fahrenheit" or the nouvelle cuisine of Zelazny's "A Rose for Ecclesiastes", fine dining is fine dining. On the other hand, sometimes you just want a plateful of chili, or a steak and baked, and that's where you'll find Leinster, complete with barbecue tongs and "Kiss the Cook!" apron. You know, comfort food, but without the pre-processed cheese. [W]orkmanlike first-reader prose which has not changed much in the last thirty years....The short, simple sentences carry the story forward in a sort of spiral fashion: one foot forward, two feet back to cover the old ground again, then another small advance. Leinster's "carefully pedestrian prose" (Knight's phrase) suits his stories just fine and dandy. Like Englishman Eric Frank Russell (see last issue), Leinster liked to posit a puzzle and then solve it right in front of the reader. This made him a favorite of John Campbell's Astounding readership, of course, and he ended up writing more than fifty stories for the magazine from 1930 (before Campbell was editor) until 1966. Perhaps his best known story for Astounding, if not his best known period, is "First Contact", which appeared in the May, 1945 issue. In a very real way, this is the archetypal Golden-Age, Campbellian yarn. Leinster posits a problem, one with far-reaching consequences: two starships meet in deep space, both of them strangers to the other. No matter how much each might wish for good relations, neither can take the chance of being followed back to their home world. What if the Stranger ship were crewed by the alien equivalents of Professor Moriarty, Genghis Khan, and Evil Lincoln, after all? Tommy said dispassionately: "He says, sir, 'That is all very well but is there any way for us to let each other go home alive? I would be happy to hear of such a way if you can contrive one. At the moment it seems to me that one of us must be killed.'" Boo -yah. Now, that's a problem to be solved. The solution is a clever one, as befits a self-educated inventor. I won't reveal it here, for obvious reasons. I will say, though, that Jenkins/Leinster is at his best in this story, "workmanlike first-reader prose" and all. Not only is there plenty of shrewdness to go around twice or thrice, not only are the characters and situations easy to comprehend and identify with, but the author weaves his trademark wit and humor throughout. The relationship that grows between Tommy Dort and "Buck" is one of sympathy and mutual respect and interest; we could ask little more of our real First Contact than to have two such somewhere in the middle of it all. 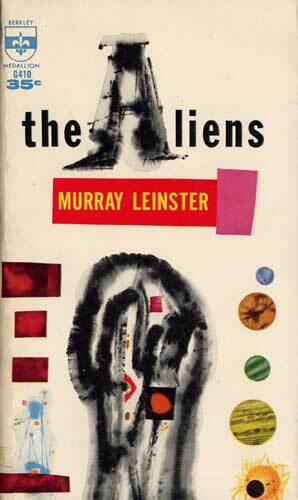 But where did the writer we in the stfnal community came to know and love as Murray Leinster get his start? What was his first undeniably science-fictional story? Let me give you a little more background first. Bear with me, I won't keep you waiting long. A long time ago, there was a weekly magazine called The Argosy . It published a lot of material - some 90k words per issueand it was one of the most popular of the dime fiction periodicals. Leinster had been selling them what the editor (one Matthew White, Jr.; Leinster described him as "...a little man with snow white whiskers and a slight lisp..." ) called "Happy Village Stories," sentimental yarns much along the lines of those sappy paintings done by Thomas Kincaid, the soi-disant "Painter of Light." ...I finished a story and sent it to him and said, "No more Happy Village stories, for the time being, I'm writing a story that I call the RUNAWAY SKYSCRAPER...the opening sentence is'The whole thing began when the clock on the Metropolitan Tower began to run backwards! '"...I got, by return mail, a letter"Dear Murray, when you finish that story about the Runaway Skyscraper, let me see it at once." And I had to write the darn thing to keep him from finding out I was a liar. The darn thing was published in the February 22, 1919 issue of The Argosy and Railroad Man's Magazine , and has seen few reprintings since. 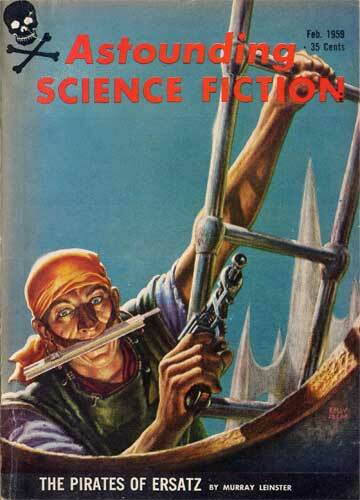 It was not, however his first sf/fantasy story to see print, as his "Oh, Aladdin!" ran not quite six weeks earlier. It took a few years for him to get around to writing sf, in spite of the fact that he'd been reading it for a long time. It wasn't just because he was selling plenty of other things, although that was certainly a factor. No, it was something else entirely. I've been reading sf and hanging with my stfnal peeps for more than forty years now, and I've noticed that there are two basic types of writers, no matter what the genre. There are those who read everything voraciously, constantly, and to the exclusion of practically all else, then wake up one day and say "Hell, I can write this stuff. What's Jules Ursula C. J. 'Doc' Heinellison del Rey van Tucker got that I don't ?" and then they start cranking them out. Then there are those who read everything voraciously, constantly, and to the exclusion of practically all else, then wake up one day and say, "Boy, I wish I could write like Cordwainer L. Sprague Isaac Poul O'Spinrad Aldiss, but I just don't know..."
I had been reading science fiction and I loved it, but I didn't think I was smart enough to write it. But...when I had to do it, I got away with it....I was very much surprised to find that I could write this type that I had admired so much and loved so much. Well, he made up for any lost time, believe me. Just look at the biblio at the end of this darn thing. William Fitzgerald Jenkins's career as Murray Leinster lasted a long, long time. He was active, if not writing, until his death in 1975, just short of eighty years after he was born. He was a dyed-in-the-wool Southern Gentleman, generous with his time and advice to younger authors. In his recent (as I write this) collection of autobiographical sketches, Other Spaces, Other Times (Nonstop Press 2009), Robert Silverbergno slouch himself when it comes to career spanswrites of meeting Jenkins in the Astounding offices in 1956. Jenkins was already sixty, Silverberg a svelte twenty-one (and three years away from being able to purchase Fiorello La Guardia's old digs), and was there to give John Campbell a new story, titled "Sourdough." Jenkins, the cagy old pro, skimmed swiftly through the story, nodded, indicated page twelve. "I see the problem," he saidto Campbell, not to me. And offered a dazzling rewrite suggestion, with which Campbell concurred. John pointed to the typewriter on his secretary's desk and instructed me to sit down and write a couple of new paragraphs right on the spot....Campbell bought the story ten minutes later. ...I have always worked on the theory that there is always a market somewhere for a good storya notion that Will Jenkins pounded into my head many years ago. He has been writing fiction ever since 1915, his total number of stories reaching the staggering total of over 1,300, and he is the author of over thirty books....Mr. Jenkins has written almost every kind of copy including westerns, detective stories, adventure stories, love stories, comic-book continuity, reports on scientific research, technical articles, and radio and television scripts. The Leinster-Sturgeon race in the Conklin anthologies is now a "draw"; each man has appeared in all but one [viii] of my sixteen published or about-to-be-published collections. It is true that in two anthologies Leinster turned up under his own name, Will Jenkins, but this does not spoil the record. All told, Jenkins/Leinster would appear in nineteen of Conklin's forty-one anthologies, to Sturgeon's twenty-three, a very close second. Other editors would reprint his stories over and over, right up until the present. As the first Dean of the genre, he helped blaze the trail for all the other Golden-Age writers, and most of those who came later. Allen Steele, Catherine Asaro, the late Charles Sheffield, any who still write hard-science fiction, who pose and then solve sweeping problems that threaten our tiny little system, owe much to William Fitzgerald Jenkins, our own Murray Leinster. [i] Including, believe it or not, plutocracy. There was a magazine, titled The Wizard, which featured an ongoing series of stories about one Cash Gorman. If that's not a blatant attempt to combine an MBA with barbarian bad-assness, I don't know what is. [ii] Now, that's a concept to boggle the psyche, but I'll take it further: RAH owned a lava lamp, and wanted a bigger one. [iii] I wrote about these two books way back in December of 2004 in SF Chronicle #254 under the subtitle "The Deans' List(s). [iv] More on this most immaculately talented artist next time. [v]I once jumped out of my treehouse with a toy parachute, but I was never dumb enough to tell anybody about it, much less take pictures. I wouldn't have minded the $5, though. [vi] H. L. Mencken and George Jean Nathan. I told you Smart Set was important. [vii] Groff Conklin was certainly the most important anthologist of the 1950s and '60s, assembling forty-one anthos (among other projects) from 1946 until his death in 1968. [viii] The antho Conklin speaks of in which neither Jenkins nor Leinster appear was 1954's Science Fiction Thinking Machines , published by Vanguard. It's funny; you'd have thought it would have been The Supernatural Reader or Science Fiction Terror Tales , fantasy and horror not being the author's specialty, but there it is. (As usual, this bibliography is for initial appearances only, and necessarily concentrates primarily on his sf and fantasy.As Leinster/Jenkins was one of the most prolific authors in the field, a complete biblio is inevitably impossible  there are those far more assiduous than I who have worked for years to assemble one, I promise you, and they're still not finished.In any case, such a project would be far larger than even JBU would allow me, so rest assured that there's still plenty of work for you to do by sending me additions and/or corrections.I want to thank Phil Stephensen-Payne once again for his help with the below, as well as by William Contento and Stephen Miller and their invaluable Science Fiction, Fantasy, & Weird Fiction Magazine Index: 1890-2007. If you're at all serious about studying or collecting classic sf and fantasy, you could do far worse than to purchase their index.Google them for details. "The Great Catastrophe" and "To All Fat Policemen"  in First Contacts, ed.